Fish Facts: Pick a species from the drop down list below to see all the facts. Assateague, Ocean City, and Chincoteague Island are known for some of the best inshore and surf fishing opportunities along the Atlantic Coast when it comes to Sportfishing. Plan a family vacation that includes fishing for Flounder along Assateague's inlets and back bays or surf fishing for Striped Bass, Red drum and other fish from the beaches of Assateague Island. Ocean City is nearby with many jetties and a pier near the inlet by Assateague. Chincoteague Island offers plenty of fishing spots near Assateague's inland shores and is famous for its abundance of game fish. There are many places and a variety of saltwater fish to choose from. You may wish to target different species of fish as the seasons change and there are several quality fishing guides to choose from around Ocean City and Chincoteague when it comes to pursuing fish along Assateague's back waters. Flounder fishing is usually good from April through October with some of the best months being April / May and September / October. Many popular gamefish concentrate in the waters near Assateague including Croaker, Bluefish, Sea Trout, and other fish. The following pages include helpful information that describe some of the fish you can hopefully catch while on your vacation. Assateague beaches, inlets, channels, creeks, deep holes, and troughs. Flounder are found in many areas around Ocean City, Maryland and Chincoteague Island, Virginia where catch and release recreation is recommended, once you get all you can eat. Chincoteague is well known as a flounder "hot spot" and is famous for places like Queen Sound, Four Mouths, and other legendary fluke hangouts. Brown topside with a variety of spots and a white under belly. 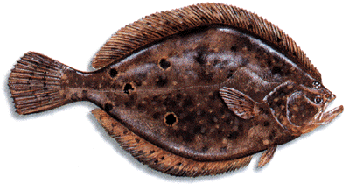 The summer flounder is the largest of the flounder species, reaching 20 pounds or greater. The world record is 22 pounds, 7 ounces. Many large specimens are caught on board commercial deep sea clam boats and trawlers. Strong fighter on light line and provides a unique battle. The flounder loves silver sides, minnows, squid, buck tails and jigs.